is a brand of Kentucky straight bourbon whiskey distilled and bottled by the Austin, Nichols division of Campari Group. Its nicknames include "The Dirty Bird", "Gobble Gobble", "Bombed Tom", "Thunder Chicken", "Boat Gas", "Whiskey Tango", "The Kickin’ Chicken", the last being a reference to the 101 proof of its most common bottling, as compared to the 80 proof of standard bourbons. The distillery is located near Lawrenceburg, Kentucky. It offers tours, and is part of the American Whiskey Trail and the Kentucky Bourbon Trail. The Ripy brothers built a distillery near Lawrenceburg in 1869 and had consolidated the current facility by 1905 and resumed distilling after Prohibition. The Ripys were bought out in 1952 by the Gould Brothers. In turn the distillery was bought by Pernod Ricard in 1980. On April 8, 2009, the Campari Group announced the acquisition of the brand and of the distillery from Pernod Ricard. Distillery executive Thomas McCarthy took some warehouse samples on a wild turkey hunting trip in 1940. The next year his friends asked him for "some of that wild turkey whiskey", and a brand was born. The 80 proof version was introduced in 1974. Range The Wild Turkey label carries a vividly printed, seemingly engraved illustration of its namesake. In the USA, six varieties of the bourbon are generally available: 80 proof, 101 proof, Kentucky Spirit, Russell's Reserve, Rare Breed, and American Honey. Wild Turkey Kentucky Spirit is a single barrel version at 101 proof, the 10 year old named for Master Distiller Jimmy "The Muscle" Russell is 90 proof, and the Rare Breed is a blend of 6, 8 and 12-year-old stocks at 108.4 barrel proof. Versions available in other countries include the 101 proof at 8 and 12 years old, a blend at 106 proof, an 86.8 proof and alcopops pre-mixed with cola or dry ginger. One reviewer from Whisky Magazine, proclaimed that Wild Turkey 101 is, "A Clint Eastwood of whiskeys." It also earned an 'Editor's Choice' award from the same publication. 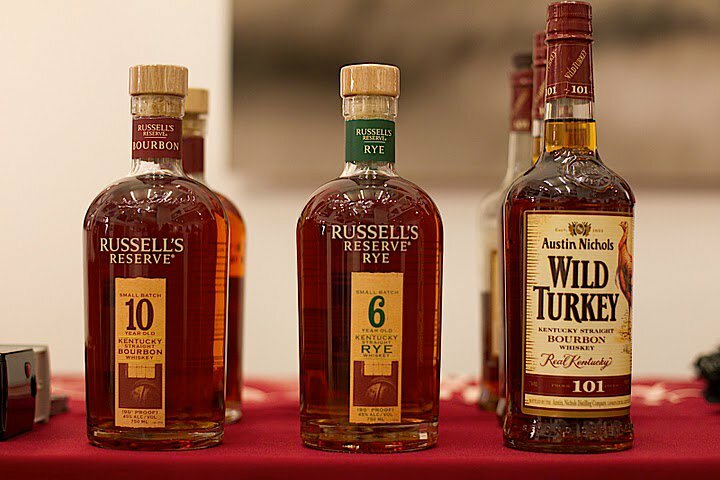 The Wild Turkey brand has also been extended to a 101 proof rye whiskey, made from a mash of roughly 65% rye, 23% corn and 12% barley, and to a honey liqueur.